This was an amazing picture as is; but Instagram added to it’s beauty by bringing out the colours of the butterfly more sharply. Now a butterfly is not a very regular sight in my balcony. 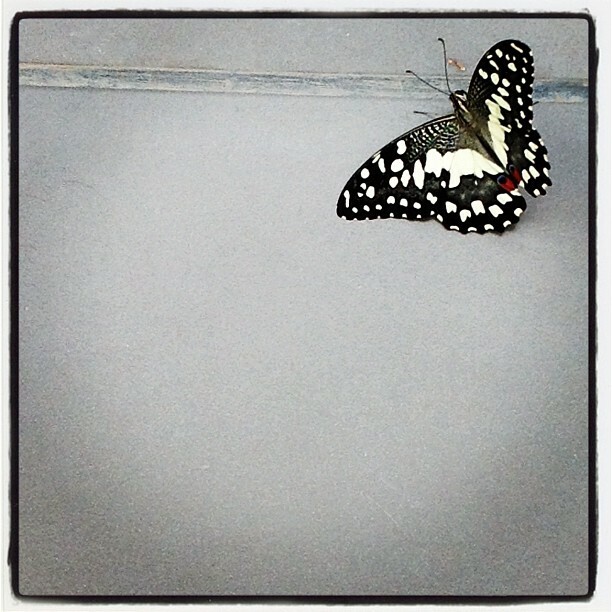 I had just come back from gym and went to put my shoes out when I saw her (I choose to call the butterfly ‘her’ and not ‘it’). I just stood inside the door fearing that she will fly if I go closer. The first picture I took was through the glass door. When she didn’t move for some time I decided I can afford a little bravery so I went closer, all the time praying for her not to get scared of me and fly away… and lo! she actually opened her wings! It was almost like she was posing for the camera. Such a delight. Such a rare delight J. I’ve never before been able to stare at a butterfly for long because they just don’t sit down but this one had all the patience. It was only on a closer look that I noticed the two red colour scales on her wings.. So beautiful! They were like a peacock’s feather tip, only red in colour. I was searching for an image of lime when I came across this http://www.nerdybirders.com/html/butterflies/lime-butterfly.html and was totally surprised to find out that this particular butterfly is called the ‘Lime butterfly’ :). It is the perfect muse for my blog!